It's official: John Frusciante has left the Red Hot Chili Peppers. The 39-year-old guitarist confirmed this week's rumours that he had quit the band through a message on his website, where he said he left the group over a year ago because "my musical interests have led me in a different direction." 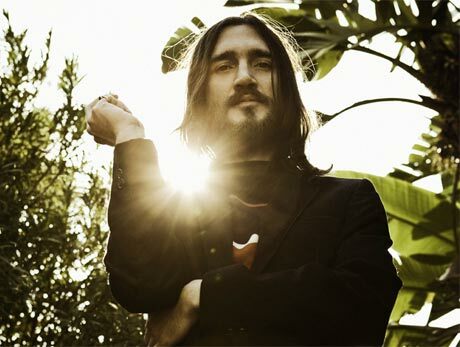 "When I quit the band, over a year ago, we were on an indefinite hiatus," Frusciante wrote. "There was no drama or anger involved, and the other guys were very understanding. They are supportive of my doing whatever makes me happy and that goes both ways." Frusciante previously quit the RHCP in 1992, only to rejoin the group in 1998 and record three more albums with the band: 1999's Californication, 2002's By the Way and 2006's Stadium Arcadium. Now, the Chili Peppers touring guitarist Josh Klinghoffer is rumoured to have replaced Frusciante, and will be recording with the band on their upcoming new album. We can only hope this departure now clears the way for Frusciante to once again work with Krautrock legend Michael Rother. When I quit the band, over a year ago, we were on an indefinite hiatus. There was no drama or anger involved, and the other guys were very understanding. They are supportive of my doing whatever makes me happy and that goes both ways. Sending love and gratitude to you all.